As one of Canada’s largest and most storied cultural institutions, the Canadian Broadcasting Corporation (CBC)/Radio-Canada had a wealth of content to showcase for its 75th anniversary celebration in 2011. One new vehicle for this content was an immersive, multi-screen digital signage project at Maison de Radio-Canada, the crown corporation’s regional headquarters in Montreal. The concept that emerged for this project was a depiction of the past, present and future. Key moments in Radio-Canada’s history and ongoing development would be made readily accessible through interactive touchscreens to the building’s 3,000 employees and 80,000 annual visitors. The content would take them through a Canadian media journey, from radio and TV to the Internet and evolving social media outlets, including YouTube, Twitter and Facebook. 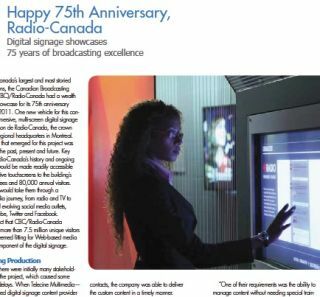 Given the fact that CBC/Radio-Canada websites serve more than 7.5 million unique visitors per month, it seemed fitting for Web-based media to be a key component of the digital signage. As a result, there were initially many stakeholders involved in the project, which caused some unanticipated delays. When Telecine Multimedia—a Montreal-based digital signage content provider and installer—came on board in late June 2011, it faced an aggressive five-week timeline for creation, testing and implementation. The work would start on July 18 and needed to be completed by Aug. 22, in time for the first in a series of Radio-Canada’s 75th anniversary celebrations. Telecine enforced a point-person approach to ensure efficiency of communications and project management. With services responsible to these three contacts, the company was able to deliver the custom content in a timely manner. Radio-Canada required a series of complex digital signage content templates and scripts, Web browser integration and a custom interactive audio player. Telecine staff engineered these elements using out-of-the-box Scala software tools, without needing much new coding, while also consulting with the client to steer the project toward the most efficient, cost-effective, easily updated content templates. This complete, centralized content management system had to manage and update multiple types of display screens, with scalability for future expansion. Scala’s software was used similarly in 2010 during the Winter Olympics in Vancouver to support the Bell Ice Cube, an interactive video environment housed in a temporary 3,000-square-foot structure. The center attracted more than 4,000 visitors each day during the games, allowing them to watch teams compete in high-definition and to interact with Bell’s “smart cube” displays. Another key factor in this regard for Radio-Canada was the fully bilingual content management interface for the Scala software. This meant in-house system users could operate in their choice of either French or English. The system was deployed within the facility’s 1-kilometer (0.6 miles) long grand indoor concourse, which is accessible to the general public at all times but was in need of a modernization upgrade to reflect the broadcaster’s creativity, current values and heritage. Before Telecine’s involvement, Montreal-based Sid Lee Architecture had worked with Radio-Canada to design the concourse’s new look, including refreshed décor. Hardware installation was handled by the client. As a broadcaster, Radio-Canada employs skilled technicians who could handle the job just as well as anyone else. Another benefit of this partnership was working with Radio-Canada’s sheer wealth of content. The system used 25 HP media players running Scala’s software to operate 46 screens, including LCDs featuring the crown corporation’s major accomplishments and awards, the interactive touchscreens, projected displays with employee communications, a 4x1-foot video wall (using half-height displays) and more LCDs with schedules and coverage of live events. Some screens feature black-and-white photos of notable past personalities. Digital projectors enable moving logos to appear on the walls at each end of the hallway. Another projection is dedicated to long-form international content. Given the breadth of the project, Radio-Canada had to turn to several manufacturers, including Panasonic, LG and Sharp, based on when they could deliver their hardware. “Radio-Canada was manufacturer-agnostic,” Fine said. As the project unfolded, however, it became apparent the timeline would not allow for the hardware to be fully tested prior to on-site installation. And unfortunately, several systems were found to be defective. “It was the final weekend before the grand opening, and we were not happy with the speed of response on some of the touchscreens,” Fine said. Telecine immediately sourced alternate players with superior specifications to deliver a more responsive interactive performance. “In a normal production schedule, any issues like this would not have to wait until the last weekend,” Pieters said. Radio-Canada held an open-house celebration in early October 2011, attracting a turnout of more than 12,000 visitors. It was the first time the organization had held such an event in nearly 20 years. Telecine is also remaining involved in the project in a limited fashion, answering technical questions, training new Radio-Canada staff and handling ongoing maintenance. The goal is to ensure the 75th anniversary project can prove perennial.